COLUMBUS, OHIO–Earlier this summer my colleagues and I had blog posts describing how we use our iPads in geological fieldwork (with examples from the limestones of Estonia to the basalts of Iceland). 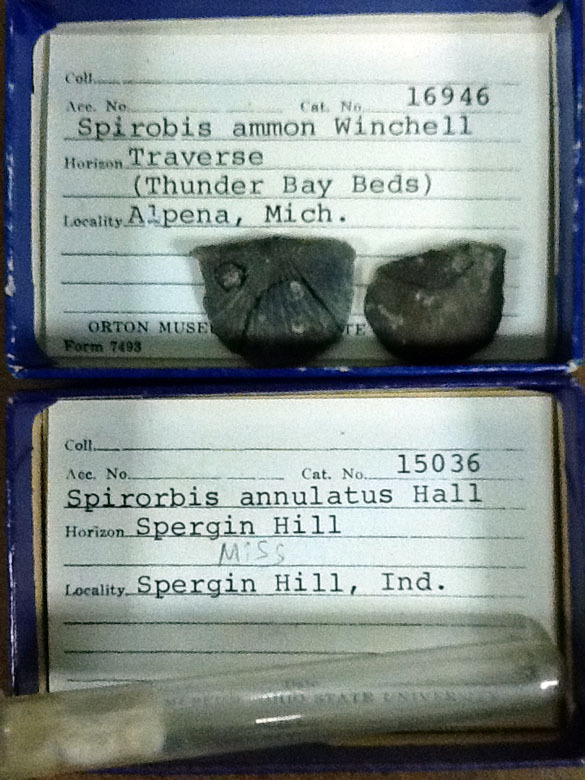 Today I used my iPad2 during work in the collections of the Orton Geological Museum at The Ohio State University. The simple camera utility built into the iPad2 makes recording quick images of specimens in their drawers and trays very easy. The LED backlighting makes the large image on the screen brighter than the actual view, which you can see in the photo above. Combine this with the light weight of the computer and it is actually easier to use the iPad2 for these images than a standard digital camera. The quality of the iPad2 image is not as good as that from a camera (with flash or auxiliary lighting), but we’re just collecting initial views and labels with this process (see below). As with the images collecting during fieldwork, I can easily annotate the museum photographs with a program like Sketchbook Express. (Circling features for later detailed camera photography is what I do most often — museum staff typically don’t like us drawing on the specimens themselves!) The Boxwave Stylus remains my favorite drawing tool on the iPad2. The iPad2 is also the most convenient repository of scientific papers I have ever used. It can store thousands of pdfs for quick referencing. The luminous screen makes reading them in the typical dingy light of museum collections easy, and images and text can be expanded for more visual detail. (Try that with paper!) A laptop certainly does these same things, but far more awkwardly while hunched over a museum drawer. The program I use for pdfs is PDFReader Pro (with pdfs transferred through Dropbox), but my friend Bill Ausich at The Ohio State University showed me that iBooks is just as easy to use. I like to store specimen images from other sources to compare to the fossils in the drawers before me — making identifications this quickly helps me decide which specimens to borrow for later work. I can store the images as jpg files in the iPad2 Photo library or view them as pdfs in PDFReader Pro. 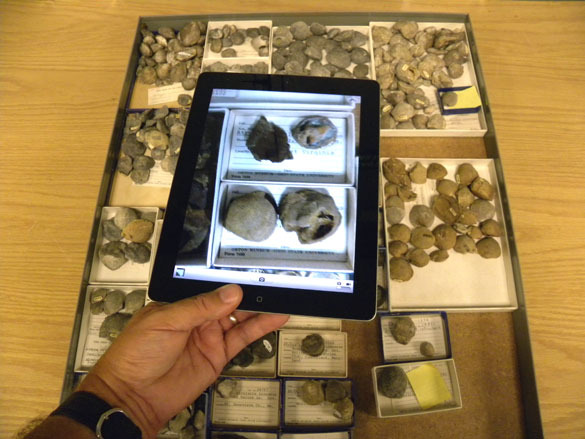 In summary, the iPad2 has quickly become indispensable for my paleontological work in museums.